Figure: Amplification of human GAPDH gene target with 2X HoTaq Real-time PCR Kit. 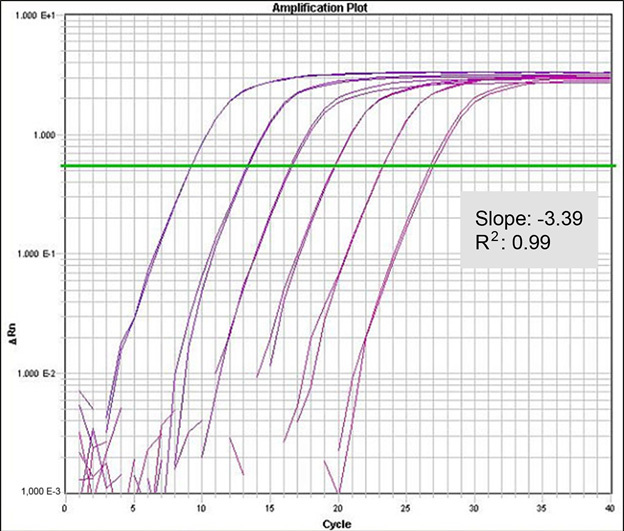 Amplification curves are shown for ten fold dilutions of 0.0002pM to 20pM of plasmid. Inset shows the standard curve data. This is a high performance real-time PCR reagent. It utilizes MCLAB's proprietary quantitative PCR technology. 2x HoTaq PCR Reaction Mix products are superior in amplifying difficult templates comparing with similar products from other suppliers. - This is the amplification of GPIIB gene (70% G+C) . - 10 ~ 10K copies from 30pg human genomic DNA have been detected. Probe based quantitative PCR: including DNA quantification, 2-step RT PCR, SNP analysis, etc. 95°C, 10 minutes. -> (95°C, 5 seconds. -> 60°C, 30 seconds.) for 50 cycles. To achieve accurate quantification, it is highly recommended to do replicates and to reduce pipetting errors. 2. D. H. 1991. Proceedings of the National Academy of Sciences USA 88:7276-7280. 3. Livak, K. J., Flood, S. J. A., Marmaro, J., Giusti, W., and Deetz, K. 1995. PCR Methods and Applications 4:357-362. 4. Lee, L. G., Connell, C. R., and Bloch, W. 1993 Nucleic AcidsResearch 21:3761-3766.